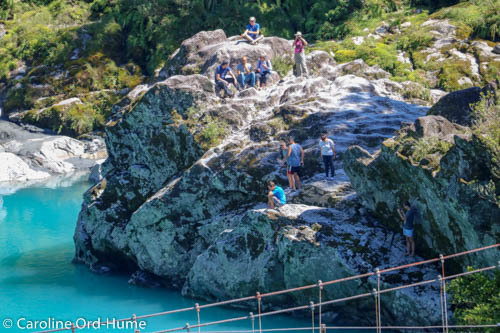 Include a visit to Hokitika Gorge Scenic Reserve to your tour if you are visiting the West Coast of New Zealand. 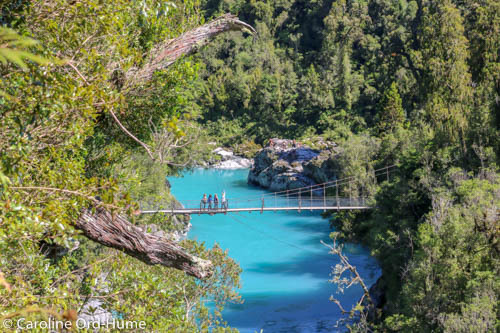 The gorge is a location not to be missed; it does look just like the vision presented in images, and you will be amazed when you first see the unusual turquoise blue water of the Hokitika River making its way through the steep sided gorge! 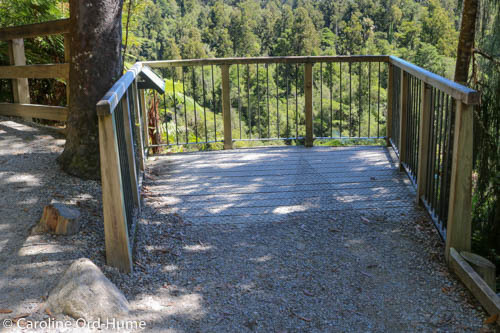 From the car park it’s only a short walk to get to view Hokitika Gorge along a well maintained walkway track through native bush and forest consisting of Rimu and Podocarp. Hokitika Gorge walk photos, images of the boardwalk. 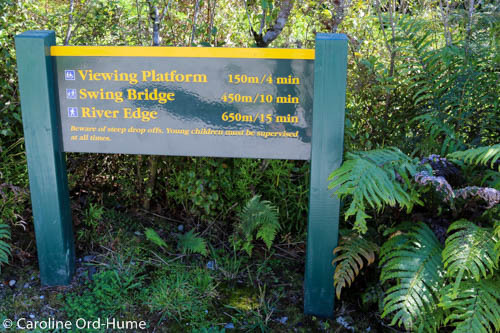 The walk brings you the first viewing platform after 4 minutes that provides an excellent view looking down over the Hokitika Gorge, the amazing waters in the river, and the swing bridge. In the other direction the view follows the river out of the gorge and across Kowhitirangi farming country. Continuing on the walk takes you down to the swing bridge. 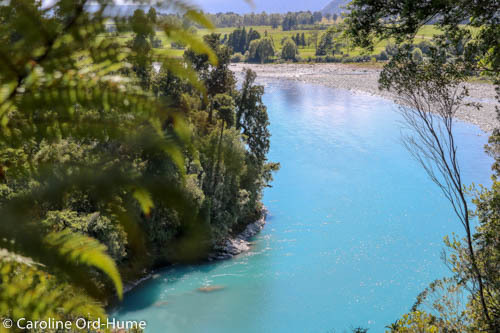 From the bridge level you get a different view of the unusual blue-green coloured Hokitika River water winding its way through the steep rocky sides of the gorge. You can then choose to cross the high swing bridge and turn left once on the other side which leads to further gorge views that can’t be seen from the other side of the river. 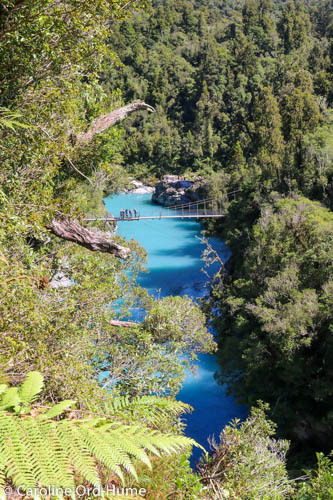 From there you can continue the Hokitika Gorge walk for around 200 metres to another viewing platform providing a view up river from the swing bridge. 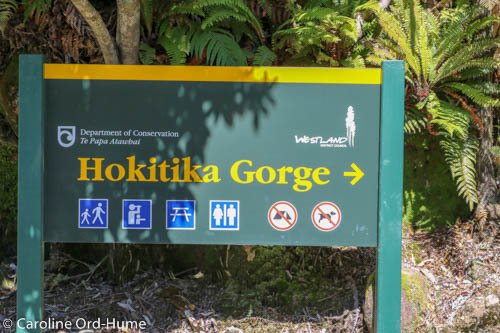 Information boards details and gorge walk map are further down this page… along with directions to get to Hokitika Gorge Scenic Reserve from SH6 at Hokitika. 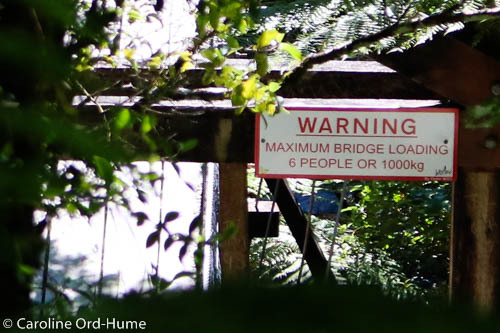 There is a warning on the swing bridge that a limited number of people should be on the bridge at one time due to the impact of weight on the bridge. So don’t go on it if that number of people will exceed the recommendation on the sign on the sign at the entrance to the swing bridge. The bridge does sway or swing when people are crossing, it is pretty high too. Sometimes other people purposefully make the bridge swing when they are on it (for a laugh). So if you don’t want to be on a wobbling swinging swing bridge, check out who is on the bridge before crossing. 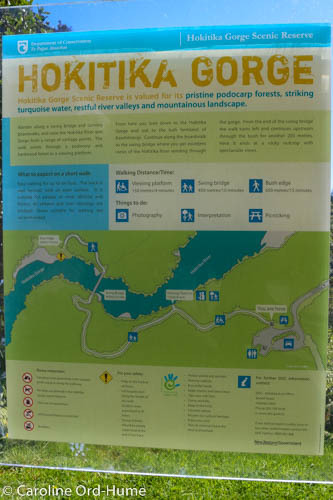 An information board at the car park displays an overview of the gorge and walking track and provides all the details you need about the walk, length of time for the walk, where the viewing platforms are, accessibility, and the reserve rules (such as no dogs allowed). 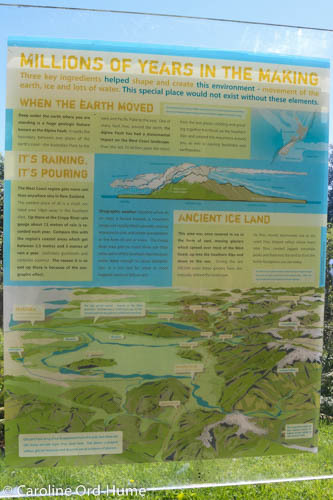 Another information board provides historic and scientific information of how Hokitika Gorge was formed over time according to geology and elements such as water. I recommend you take sandfly repellent with you to Hokitika Gorge to prevent sand-fly bites ruining your experience. The sandflies at the Gorge can be pretty savage sometimes. If you have already experienced sand flies on the West Coast you probably have some in your bag anyway! 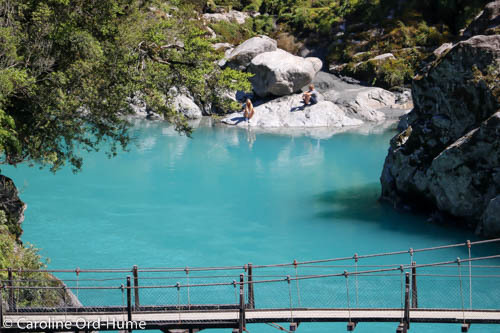 It is 33km from Hokitika town to Hokitika Gorge and it is well worth the drive. There is a car park with toilet facilities there and information boards. Head inland from Hokitika by turning off SH6 onto Stafford Street which changes into Kaniere Road. From there the route to the Hokitika Gorge is well signposted all along the route. Basically, just follow the signs all along the route and be aware there are a few turnings, although sometimes the turnings are on the same road name. Right onto Kaniere-Kowhitirangi Road, right at the T junction to remain on Kaniere-Kowhitirangi Road, cross a one-way bridge then turn left which is also Kaniere-Kowhitirangi Road, then a right to continue on Kaniere-Kowhitirangi Road. Left onto Johnston Road, right onto Nielson Road, left onto Whitcombe Valley Road and that road will take you all way to the Hokitika Gorge car park. Keep your eye out for the Koiterangi Incident Memorial along the way, it is about 14km from Hokitika. Things to do in Hokitika and on the West Coast of the South Island.